We learned that in Tanzania, there is no such thing as a full vehicle. The bus operators will let as many people on a bus as possible, packing people in like sardines. People stand in the aisles, including women holding babies in brightly colored slings and men with pungent body odor who end up face-elbowing those unlucky enough to have aisles seats and there are random seats hidden all over the bus. If they could put seats on the bus roof, I’m sure they would. The bus stopped frequently. It seemed that every 10 feet was a bus stop. Why person at point A couldn’t walk the 10-feet to point B, I have no idea, but I will say that after 8-hours of this it got on my damn nerves. The bus also transported cargo, so even if no human was boarding and disembarking, the bus would stop to deliver large packages of food. We were even lucky enough to be on a bus that had a mechanical issue: adding a 40-minute delay to our ride. People throw trash out of their windows on the side of the road. As an American who’s had the “Don’t Litter!” admonition ingrained in my brain since I started toddling, I have a Tourettes-like reaction to seeing others litter. I calmly, repeatedly reminded myself that it was a different culture as I watched someone toss a cookie wrapper out the window, spoiling the beauty of the surroundings. Even still, when the gentleman in the seat in front of me steadily tossed his orange peels out of the window, I almost had an aneurysm. Listening tomuzak playing on the speaker system (90s era Celine Dion and Michael Bolton, kill me now) did not quash my homicidal feelings. To the lady with the baby seated behind me: I am sorry your baby didn’t like wind blowing in his face, but that bus was a furnace where body odors go to fester and radiate. It takes a village to raise a child: hand your baby to someone else (people were regularly doing this) and leave me and my open window alone! 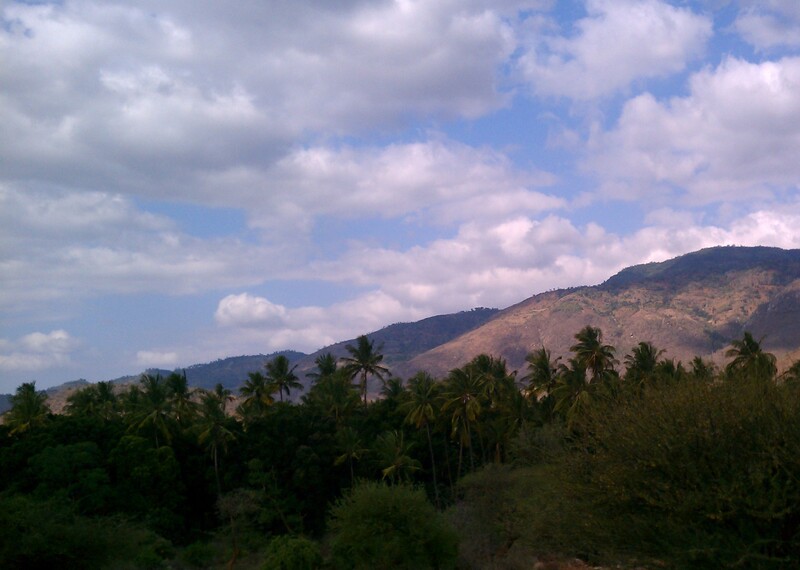 The scenery on the drive to Tanga is gorgeous. The Usambara mountains are in the background. When we finally arrived in Tanga, a harried 8-hours later, we had to endure the jockeying of taxi drivers. The minute one puts a foot on the bus step to descend, at least four men approach you to strongly encourage you to choose their taxi over the shady guy next to him. Some even come to blows over potential customers. “Sista, sista, dada, taxi! Taxi!” We still had more traveling to do as it’s a 45-minute ride to Pangani from Tanga. One driver offered to take us in his tuk-tuk and another taxi-driver shut him down for that nonsense. Four people, including two men, and our bags, were not going to fit in a tiny tuk-tuk. We finally chose a driver who seemed the least likely to rob us and make us the subject of a “when travelling goes wrong” documentary. Other than our taxi driver stopping during the ride to pee on the side of the road, being stopped by roadside police (who thankfully weren’t corrupt) and being forced to listen to Akon’s annoyingly high-pitched “my jublies are in a vice grip” voice on the radio, the taxi ride was uneventful. It was clear when we arrived at Peponi (which translates to ‘paradise’ in Swahili) Beach Resort, that the distressing bus ride was worth it. 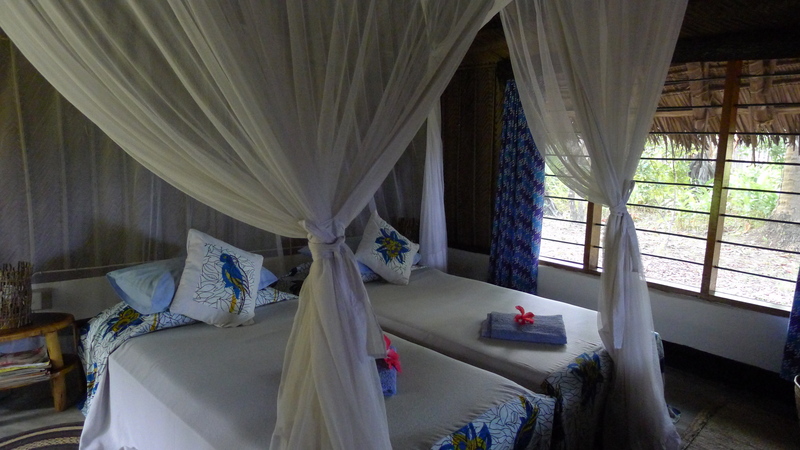 The place is gorgeous with Bougainvillea , mangroves, palm trees dotting the grounds and a view of the Indian Ocean only a few feet away from the bandas and campsites. We later discovered cute monkeys, a few resident cats, mongoose, crabs and turtles. Inside our banda at Peponi Beach Resort. The mosquito nets doubled as a canopy during the day. The grounds were beautiful and the banda adorable, but we were ridiculously excited about the prospect of taking a hot shower. The shower most of us shared at the volunteer house didn’t want to give us hot water, so we’d spent days taking cold showers. We had a window from 5:30pm – 8pm for a hot shower. Hot showers are bliss. After dinner (whole crab, yum!) we walked on the beach that night. 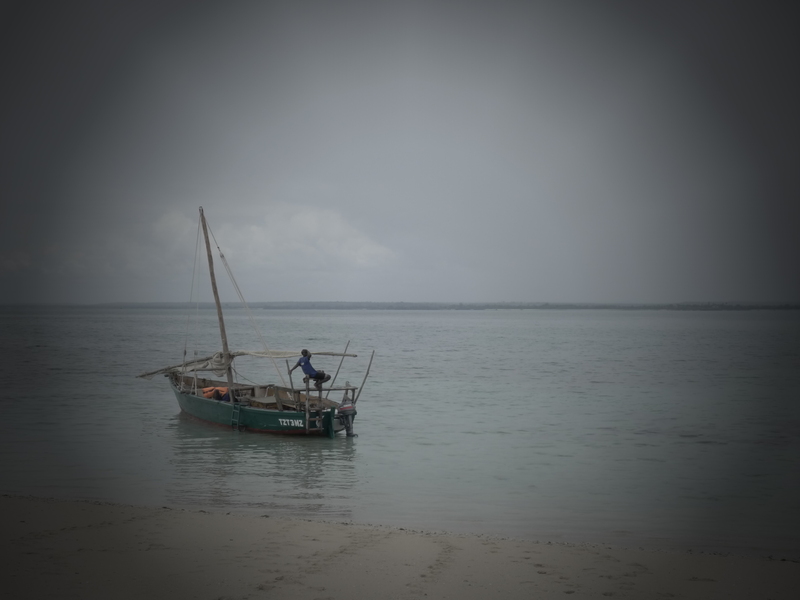 It was low tide and we walked on the sand that just earlier had been completely submerged in ocean water from the Pemba Channel as the moon shone brightly on the water. Amazing doesn’t even begin to describe it. 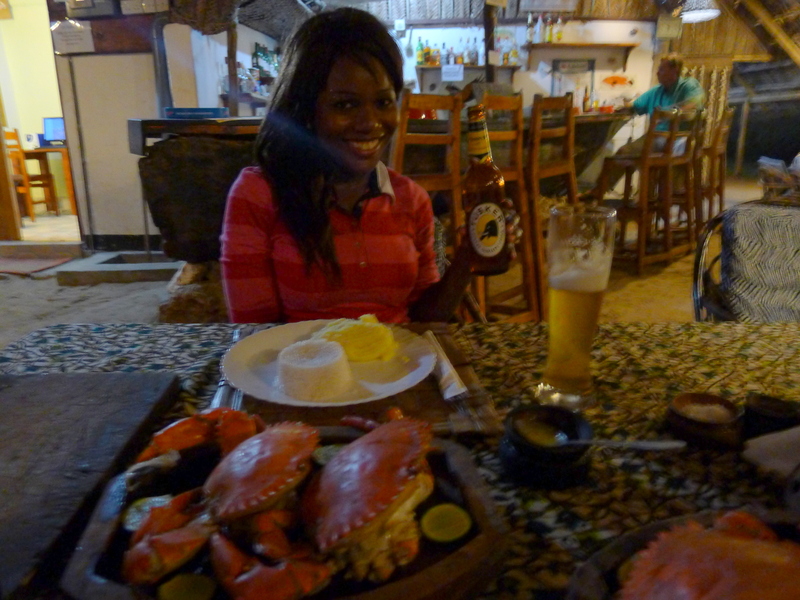 Ready to enjoy my first meal of seafood in Tanzania and drinking a glass of Tusker (or ‘tasca’ as it sounds when said with a Tanzanian accent), a Kenyan beer. We arose early the next morning for our dhow snorkeling trip. The water was definitely not as clear as say, the Pacific Ocean near Costa Rica, but it was still a great time. Our foursome was joined on the dhow by a young couple from Amsterdam and an older couple from Toronto. While snorkeling we saw massive coral reef and a few colorful fish. I also had the pleasant experience of getting seasick for the first time and upchucked in the ocean. That shouldn’t destroy the sea life right? It’s all organic ingredients. It also rained heavily for about 10-minutes, sending us all underneath a tarp our dhow crew set up. The dhow on which we sailed to sand island. Our captain is chilling on the boat. It’s got to be a great job. The weekend in Pangani was incredibly relaxing. I loved being in the water despite the number it did on my stomach. We all bonded even more while trading life stories, meeting a few new people and enjoying beers and wine. The calm I experienced helped temper my irritation on the bus ride back, which blessfully only took 5 1/2 hours.